Wow. I have to admit, I kinda love this poster. But maybe that's because I have a deep appreciation and love for the Telluride Film Festival, occurring every Labor Day weekend in the remarkably beautiful town of Telluride, Colorado. This year the festival chose Belgian artist Laurent Durieux as the official poster artist of the 2015 festival, and his design is now out. Durieux is one of my favorite artists already - we've featured his work plenty before on the site (The Godfather: Part I & II, It's a Wonderful Life, or Back to the Future Part II). He really captures the vibe of the charming town, which actually looks like it does on this poster, sans bear (see photo here). If this doesn't make you want to attend this festival, I don't know what else will? To buy this year's art from the shop now, head to the festival's web shop here. Durieux was chosen as the festival's 2015 poster artist. Here's a quote from him included with the Telluride Film Festival press release. Durieux: "It's a great honor for me to have been asked to design this year's poster for the Telluride Film Festival. To be associated with so many great names of graphic design and fine arts is, on its own, something I will cherish for a very long time. I am a big cinema enthusiast too and as such, it certainly was a thrill to work on a poster for a film festival of this calibre. My image for the poster is a tribute to the work of the great Edward Hopper whose work, like mine, is very cinematic. I came up with what I hope to be my own take of his painting, New York Movie (1939), by giving it a surreal twist and a dash of modernity. The way Hopper used shadows and lights has had a big influence on my work in general and he certainly has on this poster. I love nature too and so, naturally, I look forward to attending the festival and discover all the wonderful things this place has to offer!" The 42nd Telluride Film Festival runs from September 4th to 7th, 2015, over Labor Day Weekend, in Telluride, Colorado. Festival executive director Julie Huntsinger says they first found Durieux through his Criterion Collection work. "DVD jacket and one-sheet design is an art-form unto itself; capturing the mood of the film with one image. Laurent has done the same with this year's poster. He's managed to conjure the feeling and atmosphere of Telluride Film Festival with one breathtaking shot. It's simply stunning." Agreed. I'll be covering the festival as usual, so watch for additional updates. For more, visit the festival's website. So good! I love this kind of simple, flat aesthetic. 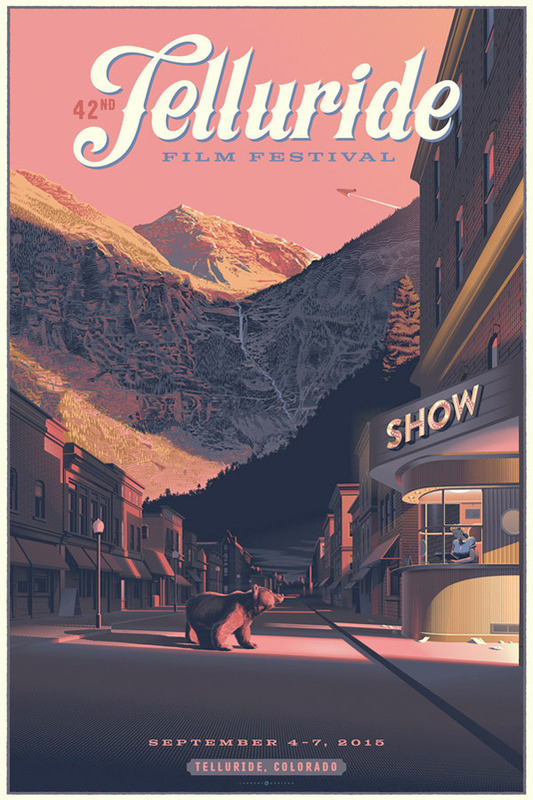 According to founding agreements between the Telluride Council for the Arts and Humanities and the Telluride Film Festival, all poster art was to be done by Telluride artists. TCAH was the co-founder of the festival in 1974 and put up most of the money, all of the organizing and established the free movie program and community "give-back" by having all honorees being given the opportunity to teach and share their art and talent with Telluride locals.What was designed to be a community art and cultural event has turned to a mass invasion of fancy pants patrons and special tickets that allow early access, special seating and Hollywood style "go to the front of the line" if you think you are a "big shot" rather than a guest of the full-time, year-round locals that truly love putting on parties and sharing our community. Telluride is not a festival and event center. Telluride is a community.